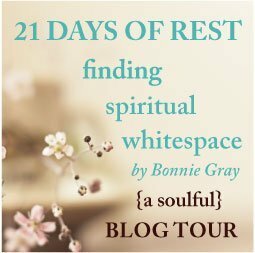 Can I share another passage from Bonnie Gray's new book, Finding Spiritual Whitespace? The world may view our broken stories and tell us it's better to hide them. To forget the shame we carry, put on a smile, and disappear under the work we do, the people we please, and the frenetic activity of keeping busy. It's true, isn't it? The world doesn't want to see our pain. It wants us to get over it, paste on a smile, and move on. I've tried to do that, and it works--for a while. Like Bonnie, I've always been a people-pleaser. I had to do everything well, be sure that everyone liked me, and never ever make a mistake. That, in combination with my painful introversion (which isn't nearly as intense now), left me mortified to be called on in class. I'd concentrate on my notebook, hide my face, do anything to avoid it. In fourth grade, we studied state history. I have no idea how often the teacher mentioned the militia, but it was a lot. And every time I thought she was saying my name. I spent half of that class in panic mode. When I was in high school, I quit the marching band. Up to that point, the director liked me. I was a pretty good clarinet player and I never missed rehearsals. But when I told him I was leaving, he was harsh with me. For an insecure 15-year-old, it was crushing. For years his words haunted me: "I've lost all respect for you." I can still see myself standing in his office while he berated me and blocked my access to the exit. One of Bonnie's writing prompts at the end of the chapter I quoted is "What is your earliest memory of being happy? Sad? Write it as a story." Although my childhood was quite normal--not idyllic, but normal--I can't think of answers for those questions. I remember insecurity. Shame. Embarrassment. I don't know where that originated, but finding a new identity in Christ has taken away most of those negative feelings. However, now that I'm reading Finding Spiritual Whitespace (and I'm only through Chapter 6), I'm thinking that maybe I should examine them. It's an extremely frightening prospect, opening old wounds in the hope of finding a different peace. If I find the courage to move forward with this, I know Jesus will be right there with me. Would you, too? The passage you selected from Bonnie's book is so powerful! I'm glad you picked it. It sounds like we have similar temperaments :) The introversion and people-pleasing, the wanting to hide...I so get that. This is a brave post, Melissa. Praying as you heal your childhood memories. I'm right there with you. Yes, Melissa, I am with you as you "open old wounds in the hope of finding a different peace." I need it, too. I can really identify with being a people-pleasing introvert. I love the passage you shared from Bonnie's book. We're in this together, ok? Praying for courage for you. I know for sure you can do the work involved in exploring those past feelings and situations. It sounds like an ideal book to guide in this process. Have courage and keep journeying! I've been on a journey of my own with God and for me it's been fighting the demons that have haunted me since childhood - the doubts, the voices that say I'm not good enough. But, as I've continued on this journey - even though the road has been difficult - I'm finding that He's replacing those voices with His and giving me more courage and boldness.